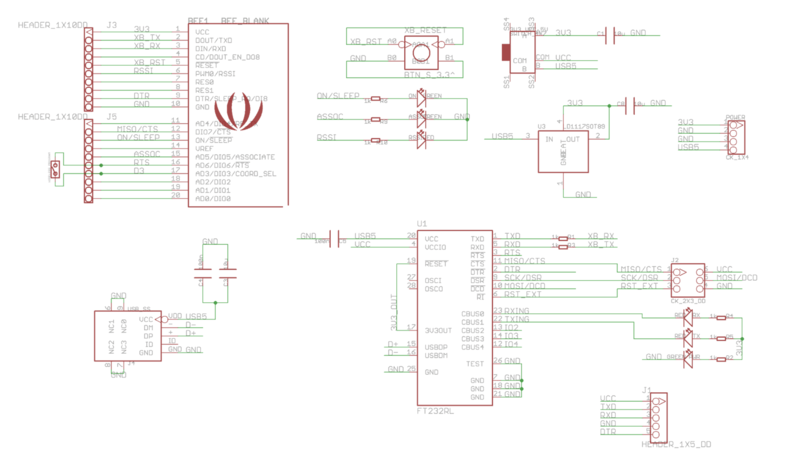 UartSBee v3.1 is a fully loaded USB to Serial adapter equipped with BEE socket(20pin 2.0mm). 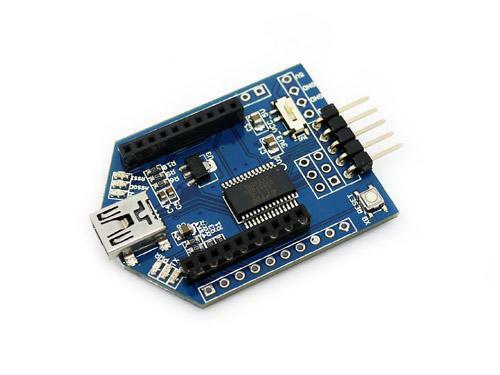 The integrated FT232RL can be used for programming or communicating with MCUs.On the other hand, you might connect your PC to various wireless applications via a Bee compatible module. UartSBee provides breakouts for the bit-bang mode pins of FT232RL as well.This Bit-bang mode pins (8 I/O pins) can be used as a replacement for applications involving PC parallel port which is scares now a day. USB 2.0 compatible Serial Interface. 3.3V and 5V compatible I/Os. 3.3V and 5V dual power outputs. Reset button for BEE modules. Bit-Bang mode ready (8 Serial I/Os or as SPI). LEDs for UART and BEE operations. Programmer for micro-controllers / CPLDs using ISP(in-circuit-serial-programming). UartSBee v3.1 provide a power selection(3.3V or 5V) toggle switch. Before connecting the board to any other device, make sure you set the power selection switch to either 3.3V or 5V. A tiny reset switch is provided for reseting Bee compatible devices. Apart from 2 x 10 Breakout for BEE compatible modules, additional pads for 2 x 10pin headers, 2 x 3 ISP header are provided.Users can solder pin headers appropriately. 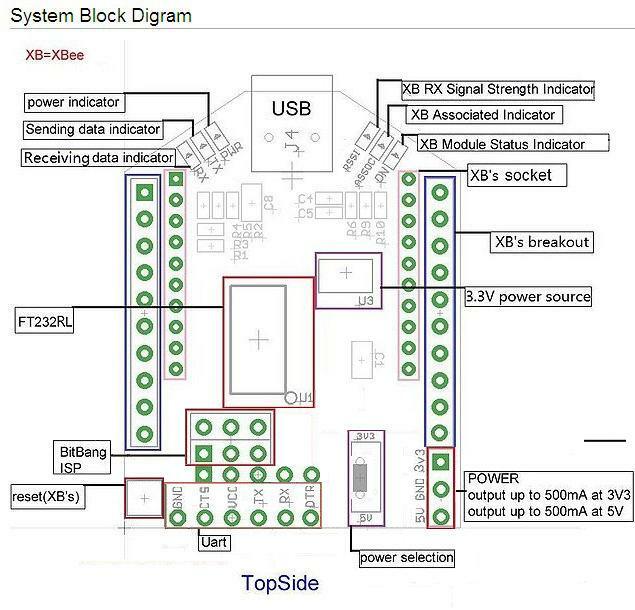 UartSBee is commonly used as USB to Serial Port (COM port) interface. This kind of configuration can be used to communicate with a MCU serial port or to program a MCU which support UART based ISP. In Windows OS, the first time you plug in the device, you might be asked for the driver. A wizard opens for installing the driver. Choose "Install from a list or specific location"
If you have downloaded unsigned driver, the following Window appears. Just click "Continue Anyway"
All modern GNU/Linux OS comes with FT232RL drivers. To check if UartSBee is detected, Issue a lsusb command. An output similar to below should appear. GNU/Linux assigns /dev/ttyUSB0, /dev/ttyUSB1 etc... as device name. 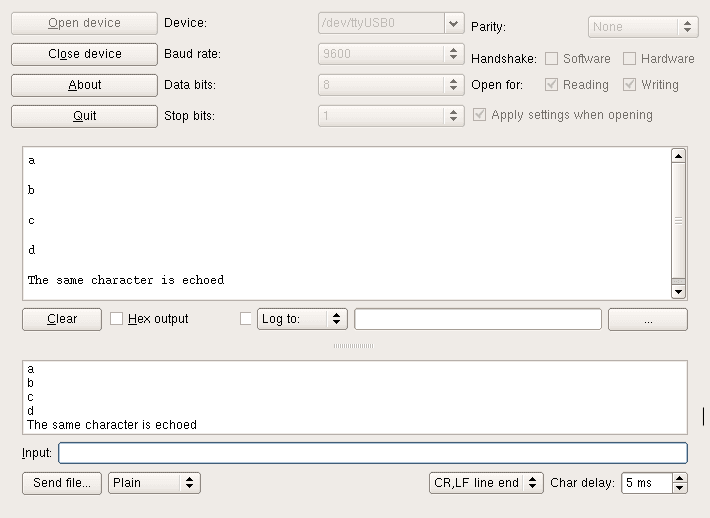 To verify the working of serial port connect TxD and RxD pins of UartSBee and use a terminal application like cutecom to configure the device parameters as shown below. Any character typed in terminal would be echoed back as shown. The same functionality can be checked in Windows - Hyperterminal as well. Apart from 3.3V and 5V power outputs provided by UartSBee , the logic level of I/O pins can be selected for 5.0VTTL or 3.3V CMOS operations. In the below example a bread based board micro-controller application is demonstrated. 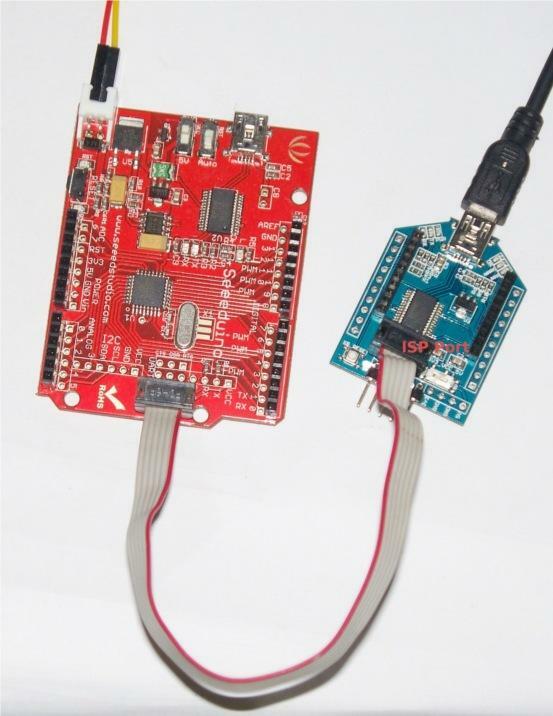 A LPC1343 ARM Cortex-M3 MCU is connected to UartSBee. As this is a 3.3V device, the power toggle switch is set to 3.3V. 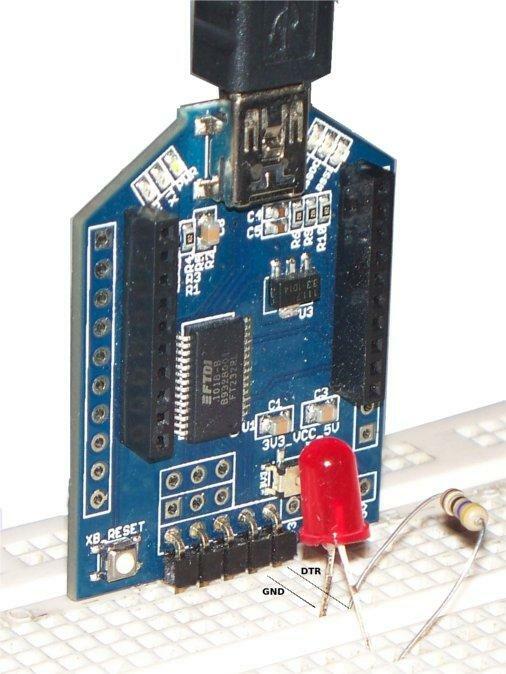 LPC1343 can be programmed through UART. This application could be extended to any MCU / CPLDs which support UART based flashing or SPI based flashing (Needs FT232R BitBang mode). BreadBoard Prototyping: UartSBee v3.1 acting as as 3.3V power-supply and 3.3V UART flash programming port for LPC1343. 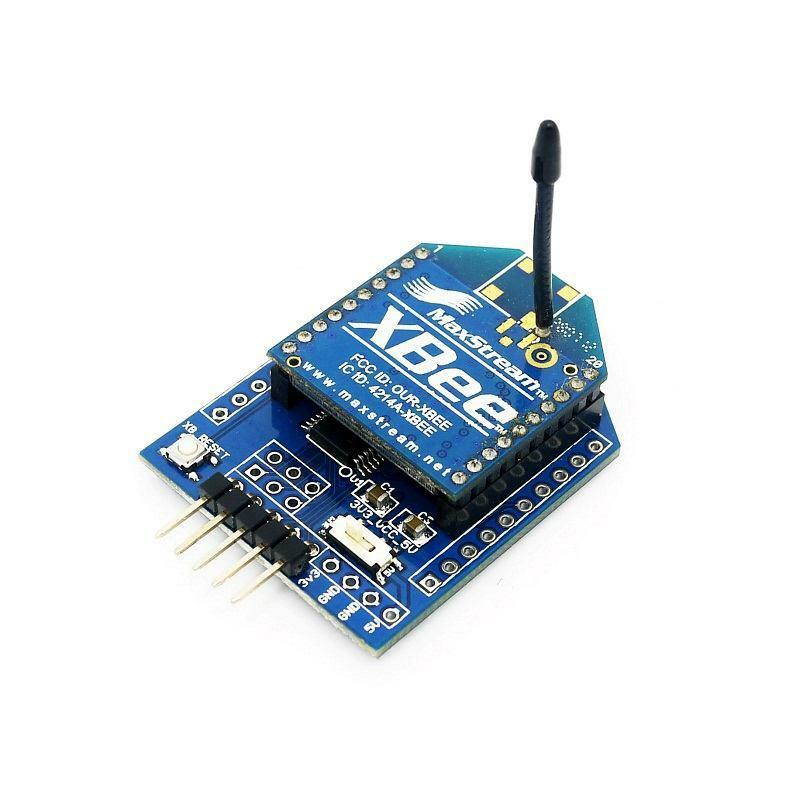 UartSBee's Bee compatible interface provided can be used to connect Bee module like XBee, Bluetooth Bee, RF Bee, Wifi Bee, GPS Bee to PC USB. This makes Bee based PC Wireless application easier. As most of these Bee modules support UART interface, PC programming is easy as well. This type of arrangement can be also used to interface with UART of micro-controllers (Seeeduino) . Please refer the Bee module documentation for more information. An nice feature of UartSBee v3.1 compared to other FT232RL based USB-Serial devices is that all the Bit-Bang I/Os are brought to the header pins. Any data written to the device is clocked to the configured output pins. The rate of data transfer is configured based on baud rate generator. In this mode any of 8 I/O lines can be configured as input or output. In this mode data is sent synchronously. An input is read before an output byte is sent to the device. Hence to read input, a write operation must be performed. This is a special mode which requires reprogramming of FT232RL EEPROM. This uses signals C0 - C3. A simple Asynchronous Bit-Bang mode operation is demonstrated in the below breadboard arrangement in which DTR (D4) pin is connected to an LED. The LED blinking rate is controlled by the PC side application program. Bit-Bang mode requires special FTDI direct driver called D2XX. This driver needs to be installed after removing the Virtual COM Port driver of FT232RL chip. In GNU/Linux this driver runs in kernel mode. As an alternative to D2XX an Free Open Source driver libFTDI is available. This works in Windows, GNU/Linux and Mac OS. It runs in user mode in GNU/Linux. Hence no need to remove the existing FT232RL driver. Blinky.C&nbsp;: UartSBee v3.1 (FT232RL) Bit-Bang mode - Blinky. FT232RL Bit-Bang mode can be used to construct AVR ISP, JTAG, SPI and I2C Ports. Refer the external links. If you have questions or other better design ideas, you can go to our forum or wish to discuss. This documentation is licensed under the Creative Commons Attribution-Noncommercial-Share Alike License 3.0. Source code and libraries are licensed under GPL/LGPL, see source code files for details. Bug Tracker is the place you can publish any bugs you think you might have found during use. Please write down what you have to say, your answers will help us improve our products. The Additional Idea is the place to write your project ideas about this product, or other usages you've found. Or you can write them on Projects page. This documentation is licensed under the Creative Commons Attribution-ShareAlike License 3.0 Source code and libraries are licensed under GPL/LGPL, see source code files for details.